Looking for a new golf push cart but not sure which one to buy? We’ve picked out the best push carts in 2019, with options for all budgets. 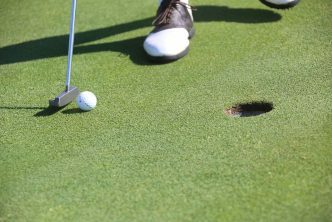 Walking the golf course is a great way to stay fit. 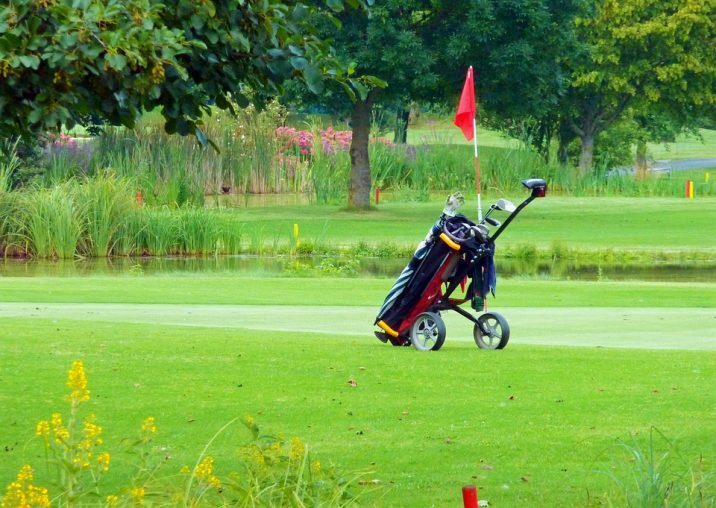 But lugging round your golf bag on your shoulders can be a little tiring, so below we’ve picked out the best golf push carts in 2019, with options for all budgets. 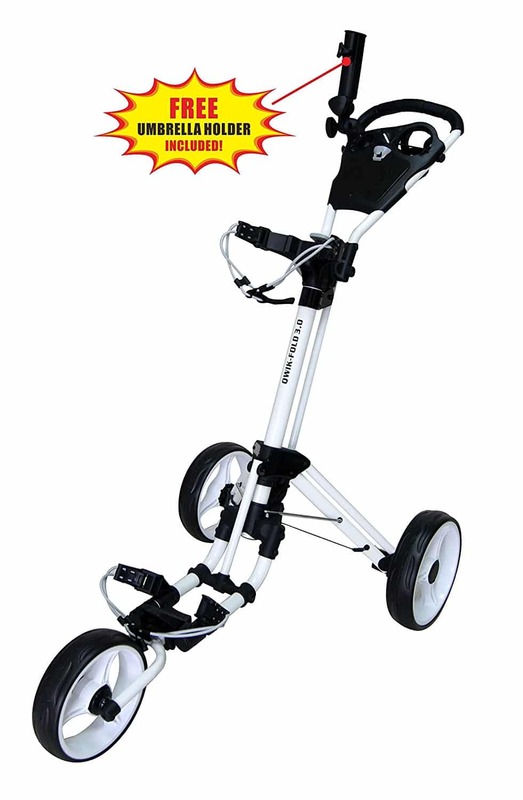 The Clicgear 3.5+ is the #1 top selling golf push cart, and it’s easy to see why. It’s lightweight, highly durable, and compact, but still has plenty of room for storage. Clicgear’s patented “slide to close” mechanism makes folding and unfolding your cart a piece of cake. The cart folds down to a super compact 13” x 15” x 24”, so you’ll be able to get it into the trunk of your car without any fuss. And when walking your course, you’ll appreciate the lightweight (yet sturdy) aluminum construction. The whole cart weighs in at just 18 pounds. Braking is controlled with a handle mounted hand brake, which we find more convenient than the foot brake system found on many other carts. The brake system is solid, and will prevent your cart from rolling away while you’re lining up that 5 footer (we’ve all been there!). Storage wise, there’s a net and a console with built in holders for your scorecard, balls and tees, and with Clicgear carts it’s super easy to add other accessories for storage. You’ll get a cup holder and umbrella mount as standard, along with additional accessory tabs for adding more storage or accessories. 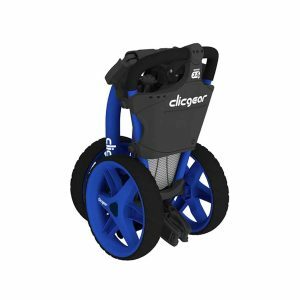 The tires are airless, so won’t require any maintenance, and if you want to match up your cart with your golf gear, the Clicgear 3.5+ is available in a range of colors to suit all tastes. 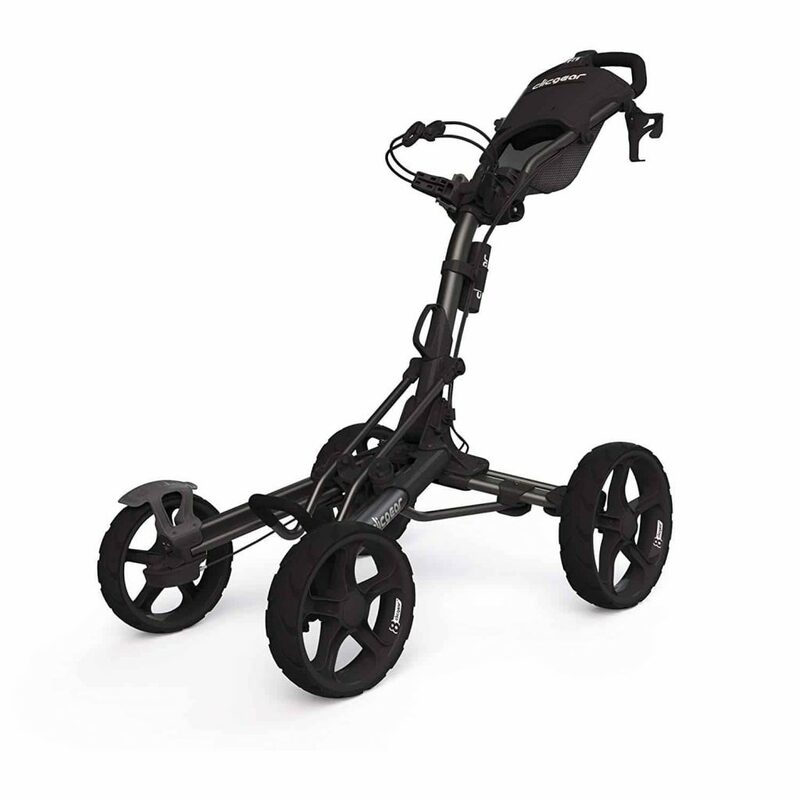 All in all, the Clicgear 3.5+ is an excellent choice for your next golf push cart. If you have a slightly bigger budget, it’s worth looking at the Clicgear Model 8. The Model 8 has 4 wheels (as opposed to the 3 on the Clicgear 3.5+), which does make it a little more stable and easier to steer overall. And while an extra wheel does add a bit to the profile of the cart, it folds down to just 15” x 17” x 27” so it’s still going to fit in your trunk without any issues. The braking on the 3.5+ is solid, but if your home course is particularly hilly, you’ll appreciate the dual front wheel braking system on the Model 8, which again is controlled by a hand brake. Another nice touch is the dual front wheel alignment system. Simply turn a screw to realign your wheels and ensure your cart is always pushing straight. Storage is also ramped up on the Model 8. The console is oversized allowing plenty of room for storing balls and accessories, and the lid closes securely with a magnet. You’ll get a cup holder and umbrella holder again as standard, but you’ll also get an XL cup holder in the box for larger drinks containers. Pricing wise, the Model 8 isn’t a huge step up from the 3.5+ and if you have the cash we think the additional features make this a very worthwhile upgrade. In fact, all things considered the Model 8 is our pick for the best golf push cart in 2019. If you’re looking for an affordable push cart that will do the trick, then the Qwik Fold 3 is a good choice. Coming in at around half the price of the Clicgear models it’s understandably less feature rich. But the aluminum frame is sturdy and lightweight, while the ball bearing wheels provide a reasonably smooth ride over bumpy terrains. Where the Qwik Fold 3 does impress is folding and unfolding. 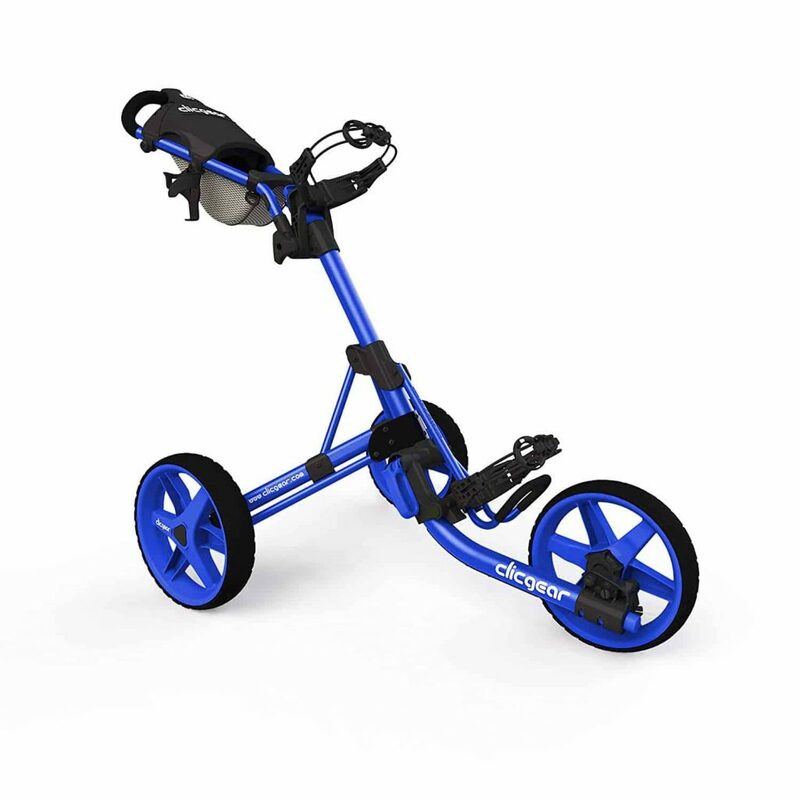 Qwik Fold claim that this is the fastest folding golf push cart in the world. While that’s a lofty claim, we must admit that the simple button mechanism does make folding and unfolding your cart incredibly painless. You might not quite do it in the 1 second that they claim, but nonetheless, it’s FAST. Unfortunately where the Qwik Fold loses some points against the Clicgear models is steering. The front wheel is fixed (doesn’t swivel) so while the ride is smooth, steering can be a little clunky. But at the end of the day, this is an affordable golf push cart. And all things considered, it’s excellent value for the money. Budget not an issue? At the other end of the scale, we’ve got electric push carts. If you get tired of pushing, just push a button and the cart will drive round the course for you. Electric carts are not cheap. You’ll generally be looking at a price point somewhere between $1K and $1,500. 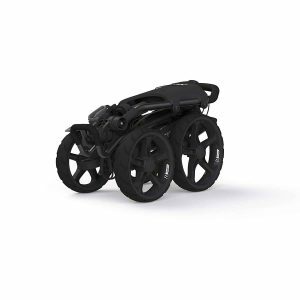 Our pick for the best electric golf push cart this year is the Bat-Caddy X8 Pro. It’s powered by 2 x 200 Watt electric motors, which run off a 12V lithium battery. 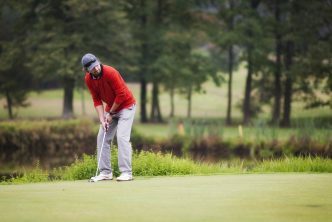 The battery is good for 7-10 miles, so with most courses coming in at around 5-6 miles (unless you’re playing extreme military golf) a full charge should comfortably get you through a round. The cart has a top speed of 6mph and can handle inclines of up to 30 degrees. Understandably it’s a bit heavier than a standard cart (22lbs), but as you won’t be pushing it around that’s not really an issue. 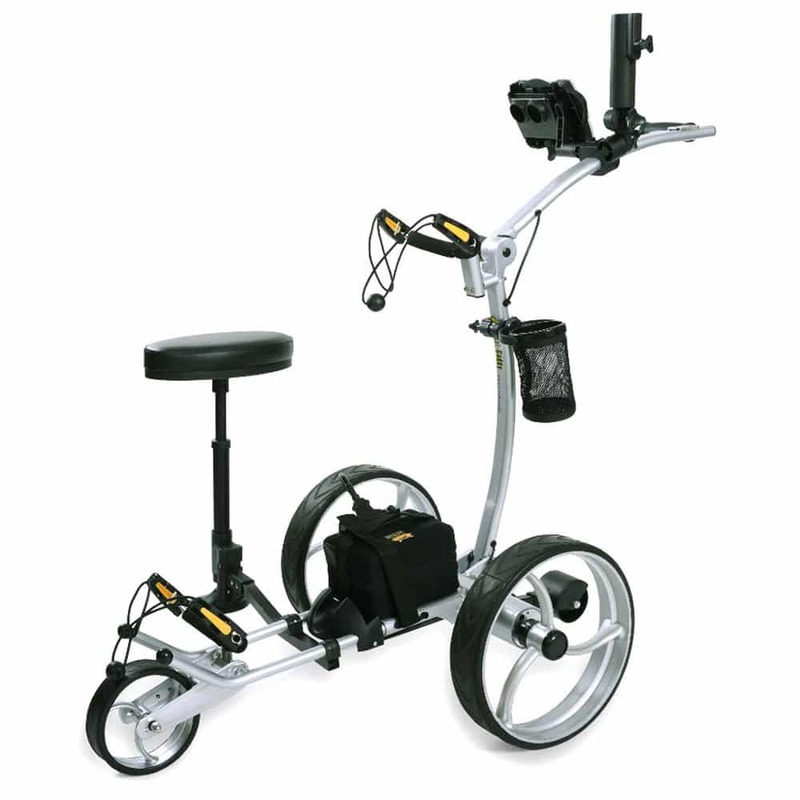 Accessories include a gold GPS holder, rain Cover, carry Bag, and remote control cliphanger. 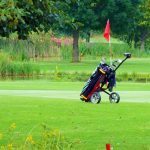 Which Golf Push Cart Is Best? All things considered, our pick for the best golf push cart in 2019 is the Clicgear Model 8. We feel that it offers the best range of features, and the best value for money. But depending on your budget and individual requirements, any of the carts featured in this guide will be a great choice. 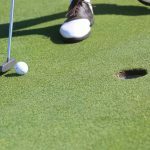 Looking for more golf gear for the 2019 season? 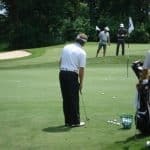 Check out our other golf gear guides here.